Photo of the globular star cluster 47 Tucanae taken with the Very Large Telescope VLT), in Chile (left). 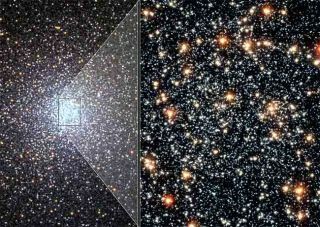 Hubble’s Advanced Camera for Surveys revealed a colored photo of the cluster’s core (right). The stellar residents of the jam-packed celestial cities known as globular clusters employ a traffic system that causes lightweight stars to zoom to the city edges while keepinggiants centrally located, astronomers have concluded. The study, detailed in the September issue of the Astrophysical Journal Supplement Series, gives the first direct evidence of such sorting, called "mass segregation," a process long suspected to occur in globular clusters but never observed. A globular cluster is a dense collection of 10,000 to more than a million stars in a region spanning just 10 to 30 light-years. The nearest star to our Sun, for comparison, is more than 4 light-years away. Researchers analyzed 47 Tucanae, the second largest cluster in the Milky Way's galactic neighborhood, and determined the cluster sorts out stars according to their masses. Due to the associated gravitational pull, heavier stars slow down and sink to the cluster's core, while lighter stars pick up speed and zip out to the cluster's periphery [video]. Just as bumps and jostles are much more likely in a packed mall or city bus, encounters in a densely populated cluster are more likely than in the quiet stellar backwater. These stellar nudges can be dramatic and over time are thought to result in mass segregation. The crowded conditions, however, have made it difficult for astronomers to pinpoint with any accuracy individual stars, let alone their velocities. Plus, the blurring effect of Earth's atmosphere can make the stars' tiny movements impossible to view, unless you have the Hubble Space Telescope's sharp eyes. The research team led by Georges Meylan of the École Polytechnique Federale de Lausanne in Sauverny, Switzerland, used Hubble to peer into the heart of 47 Tucanae, which contains a million stars and is located 12,000 light-years away in the southern hemisphere. They snapped a series of photos of the cluster over regular intervals for seven years. By placing a "picture frame" around the same cluster regions in a time sequence, they could track the positions of as many as 130,000 stars in each revealing the motions of the stars across the sky. The astronomers analyzed the data in a way that yielded star speeds corresponding to changes in their positions at the level of about 1/100th of a pixel on Hubble's digital cameras. The method provided accurate speeds for almost 15,000 stars at the cluster's center, including 23 unusually hot and bright stars called blue stragglers thought to be the product of stellar collisions. The blue stragglers, which boast twice the mass of the average star, moved more slowly than typical stars, a finding that agrees with predictions for mass segregation.